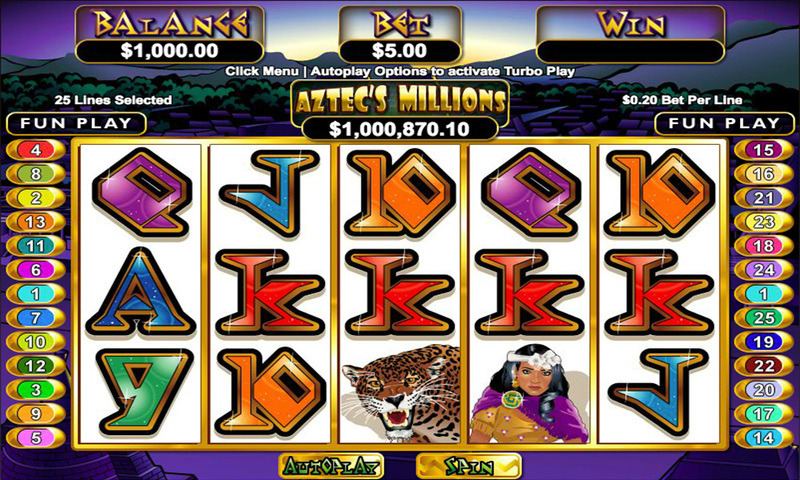 Aztec’s Millions is one of the most played games from RTG that feature a progressive jackpot. Though this game has higher betting limits and requirements than many other video slots, it is one that can yield some impressive rewards. Even if players cannot trigger the jackpot win, they will benefit from base game payouts and bonus winnings. The game offers a 5,000 standard jackpot and much more can be won with the added features. RTG has done a great job visually with the game and it also has some nice sound effects and background music. Aztec’s Millions is one of the higher paying jackpot slots featured at RTG casinos and it can be played on desktops as well as mobile devices. With this fun filled RTG game, players will see a set of five reels, each containing three symbols. There are 25 paylines offered, so there are many chances to win, but the high required bet amount explained below may deter a number of players. The game itself has an ancient Aztec theme and the symbols are bright and bold. As players spin the reels, they will see a tiger, bird, woman, playing card symbols and some special icons for wilds and game scatters. Unfortunately, this game is not available in demo mode and can only be played for real money. PLAY FOR REAL! HOW TO PLAY Aztec’s Millions? If players want to take some free spins on the game, it can first be previewed in a free play mode before any bets are placed. Once they wish to start generating payouts, they will have to bet on the 25 paylines and can place bets that start at $0.20 per payline. This is a higher betting limit than most games, so players should have a substantial bankroll when wagering. Each spin at the lowest value will cost $5. The game does not have as many controls as other video slots, so players will only have the ability to use the Max Bet and the Autoplay feature when they are spinning for real money. This RTG game has some standard features and bonus rounds that make the game fun, interesting and intriguing, all while increasing payouts. Wild and Scatter – The wild is portrayed by an Aztec King and this will appear in any position to replace standard game symbols. The wild will not stand in for the scatter or the jackpot bonus symbol. The scatter is the Mayan Gods and these can offer instant payouts when they appear anywhere on the reels. Free Games Features – With three or more scatters, the free spin game will begin and players can win between 5 and 25 free spins depending on how many have appeared on the reels. The free spin payouts will all be worth three times the normal amount and the feature can be retriggered. Progressive Jackpot – The progressive is what will appeal to many players and it is seeded at $1 million, rising with every wager that is placed. The jackpot will be won when players get the Aztec’s Millions symbol in five positions across the payline. This progressive video slot may not have much in terms of bonus features. But the overall payouts can be amazing. With the chance to win a superb progressive jackpot along with amazing standard game payouts, there are some nice rewards for real money players. The game comes with a verified RTP of 96.5% and it is one of the most played progressive games at RTG sites. Players, we need your help with how we should to rank and rate these reviewed casino games. You can help us by rating this game, and if you really enjoyed playing Aztec’s Millions. You can also share it with your friends on Facebook, Twitter and via email. For all freeplay games, if your free credits run out, simply just refresh the page and your balance will be restored. See all of our High Roller Slots game reviews where you can play 13 high roller slots games for real money in any of our recommended casino sites.